Contra Costa County Alligator lizards are good climbers, using their somewhat prehensile tail to hold on, but they aren't easy to spot in trees since they blend in well with the branches. This adult with a very long intact tail frequents this Mulberry tree in Tulare County. 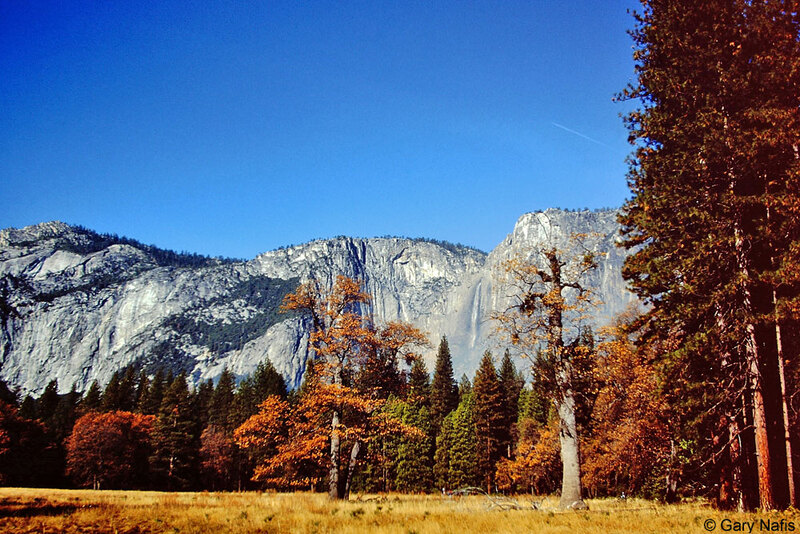 © Sylvia Durando Adult, Sutter Buttes, Sutter County. Specimen courtesy of Eric Olson. 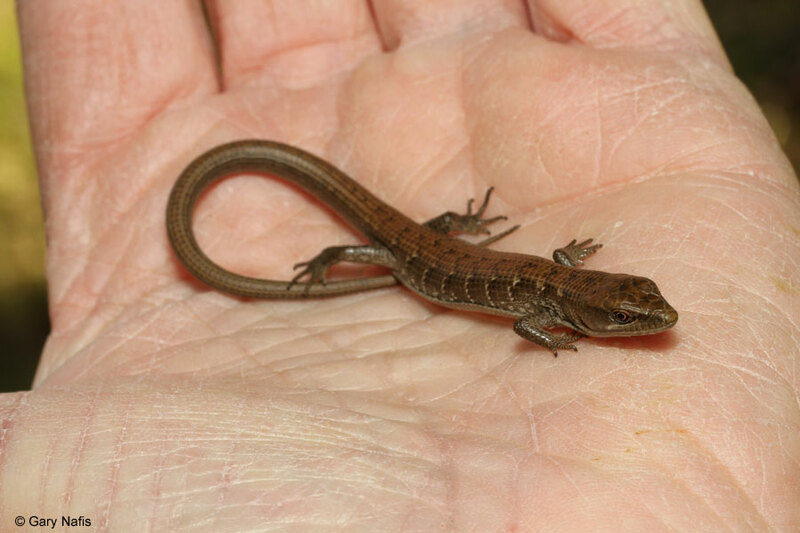 This California Alligator Lizard was found on a screen door in Alameda County. 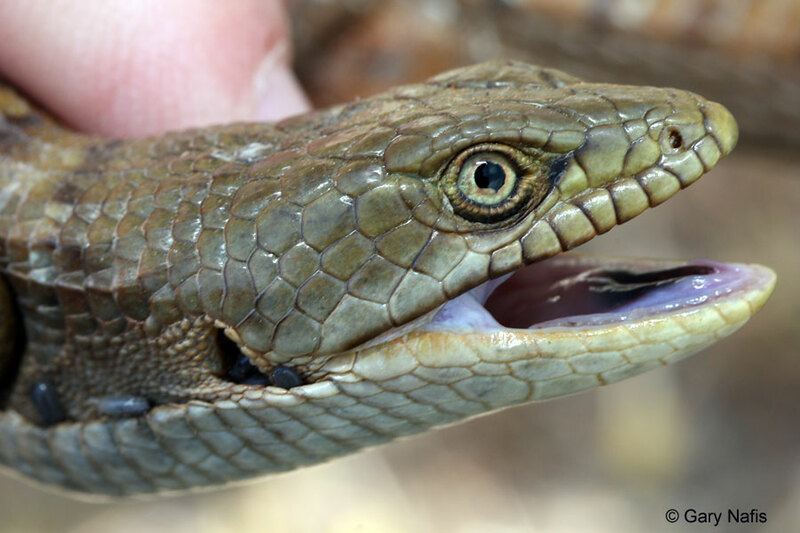 © Benjamin Martinez This California Alligator Lizard was found with the rear half of its body stuck inside a discarded beer can in Santa Clara County. 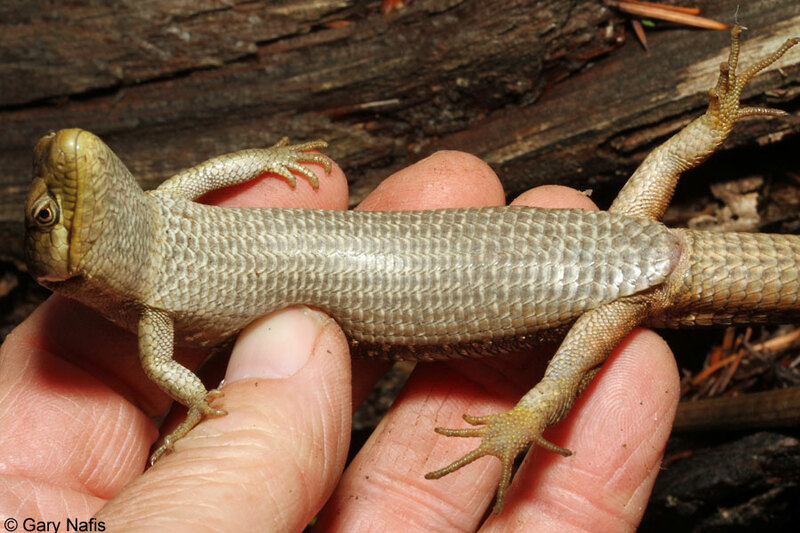 This might be proof that some lizards use beer cans as protective shells in the same way that hermit crabs use borrowed shells. Or more likely it just shows that the lizard entered the can looking for food or shelter (or maybe beer) and got stuck trying to get out. © Katie Quehl. 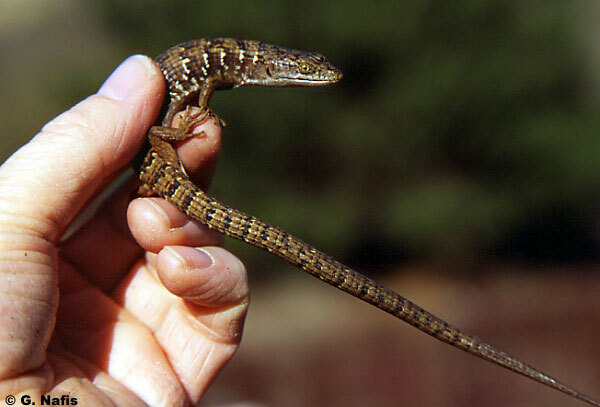 Western Alligator Lizards, genus Elgaria, have large rectangular keeled scales on the back that are reinforced with bone. 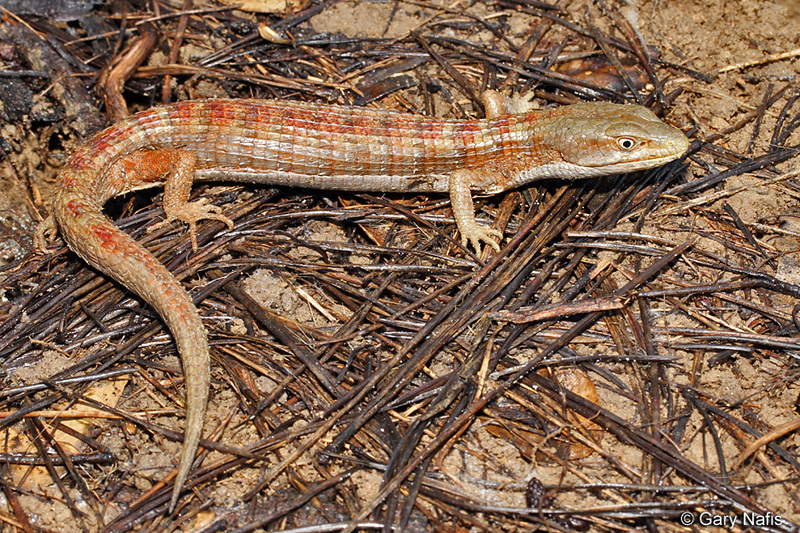 (Elgaria multicarinata multicarinata is shown here). was found in Sacramento in mid May. 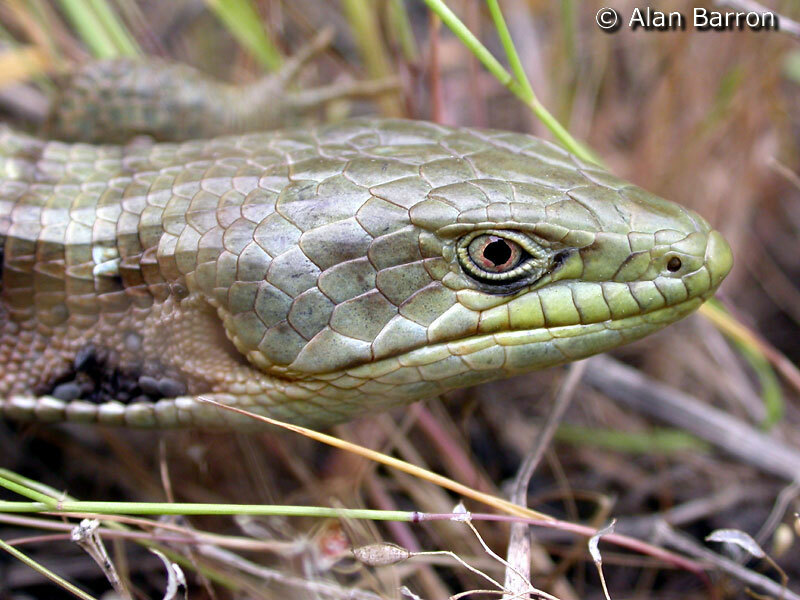 This female alligator lizard was observed sitting on a trail in Santa Clara County. 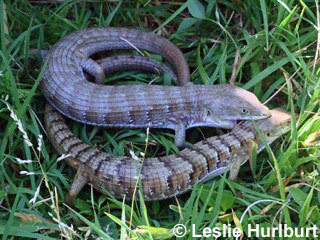 She started slowly moving in a circle lifting her tail and turning her head under her tail in a circle around her eggs. Normally a female would dig a place or find a sheltered place to lay and brood her eggs, so this behavior is hard to understand. Perhaps she was injured and laid the eggs prematurely. There's no way to know for sure but it's doubtful she was able to successfully incubate the eggs out in the open. 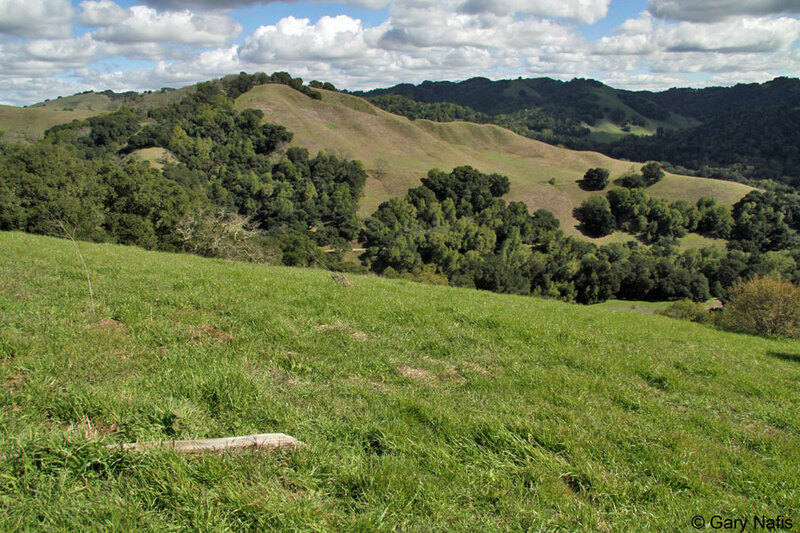 A pair of adults mating in late May in Contra Costa County. © Naomi Schiff Male and female courting in early May in San Joaquin County. 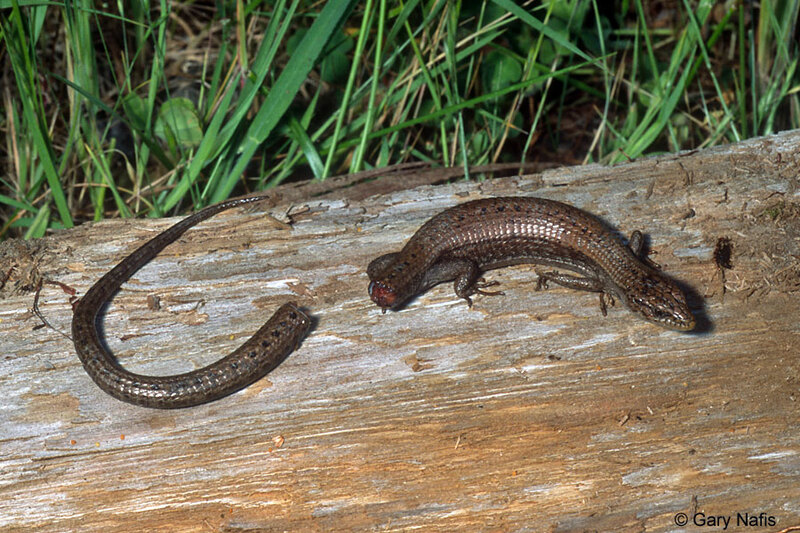 It is common to find blood-engorged ticks attached to alligator lizards, especially in and around the ear openings, as you can see on the Forest Alligator Lizard on the left, on the Shasta Alligator Lizard in the middle, and on the San Francisco Alligator Lizard on the right. As we were photographing the Alameda County alligator lizard seen above, my herping companion picked it up to get a better pose. The lizard had already been handled for 5 to 10 minutes and seemed to tolerate it, but this time it decided to drop its tail. We felt terrible to be responsible for the loss of such a nice unbroken tail. Sometimes when you pick up a lizard too close to the tail, or push the tail against a hard sufrace, you can accidentally cause it to detach, but that wasn't the case here. I put the writhing tail on the ground where it moved around for 4 - 5 minutes until it stopped, shooting some video of it, then set it back next to the lizard to get these photos. You can see the video here. The lizard was then put back under his log unharmed, but unable now to use a detached tail as a decoy until it grows another one. 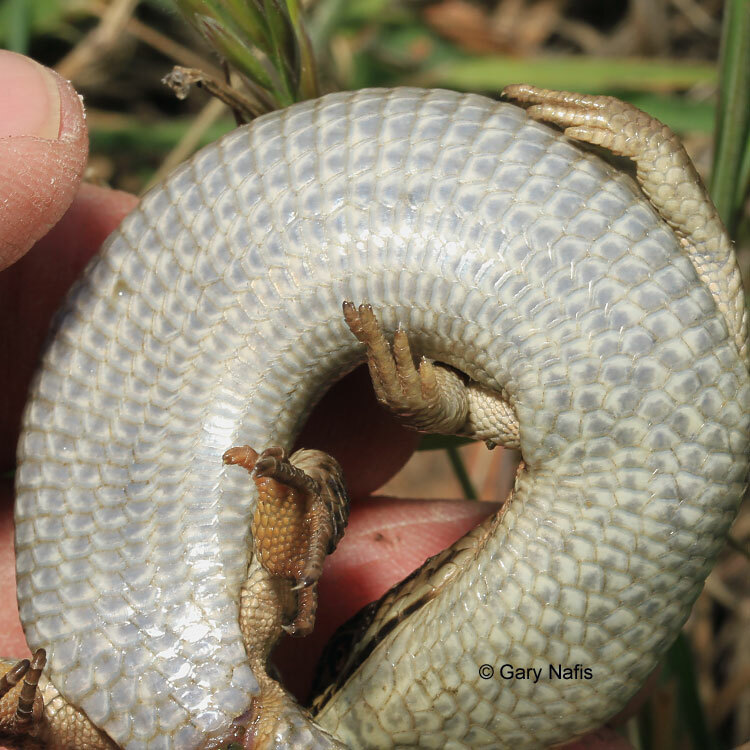 Sometimes when the tail of a Southern Alligator Lizard is broken off, two tails grow back from the break point. 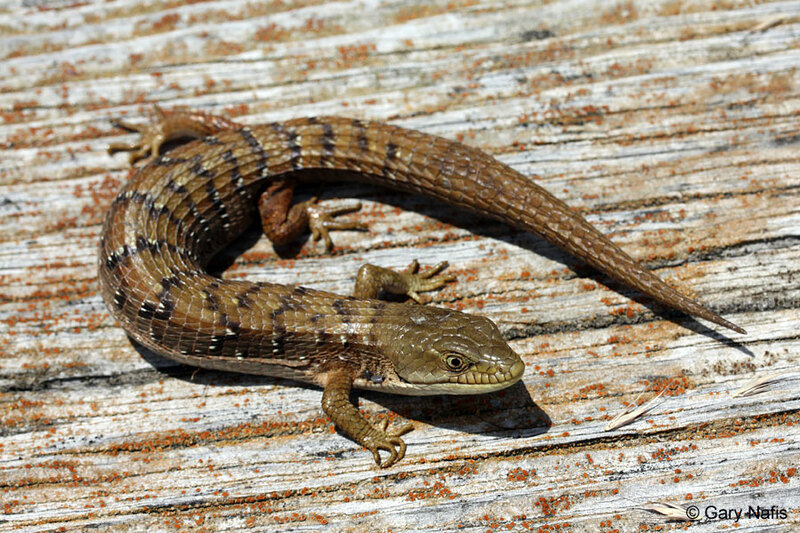 A Forest Alligator Lizard is discovered under a board on a sunny spring afternoon. It tries to bite, crawls across the ground in snake-like fashion, tries to climb over the camera, sticking out its tongue, then ducks back under its board. 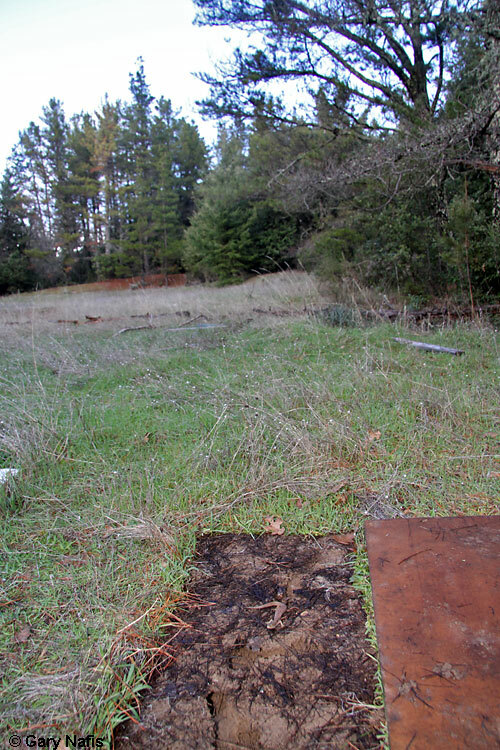 An adult is discovered under a piece of wood on a grassy hillside on a cold February afternoon in Contra Costa County. 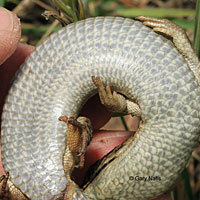 A brief look at a juvenile Forest Alligator Lizard that refused to do anything interesting for the camera. 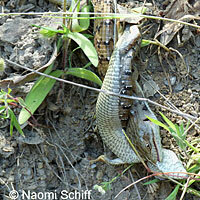 This video shows how an alligator lizard's tail thrashes around after it has been dropped to distract a predator. This is the same dropped tail seen above. The tail moved for about 4-5 minutes, which has been cut down here to about a minute, showing several different speeds until it is just barely moving. 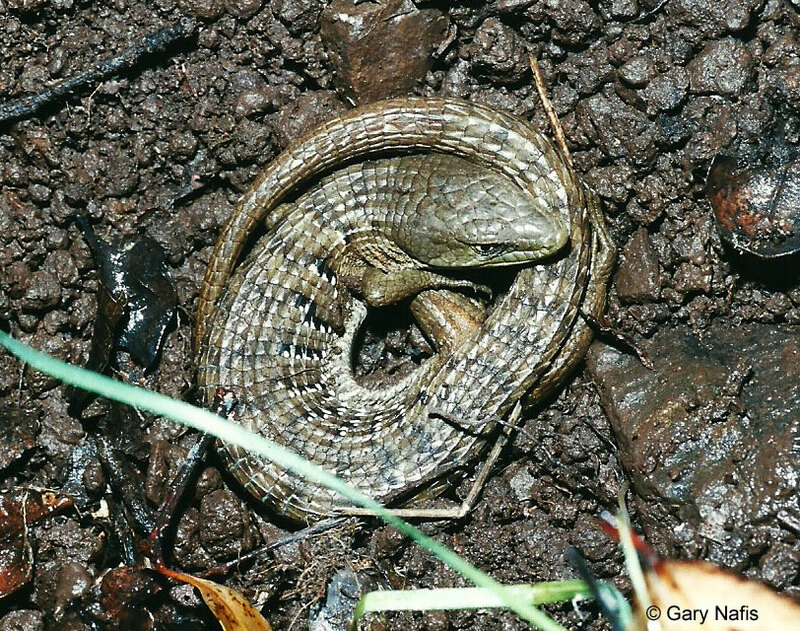 Two short movies of juvenile Forest alligator lizards uncovered in winter that don't want to move much for the camera until it's time to escape. 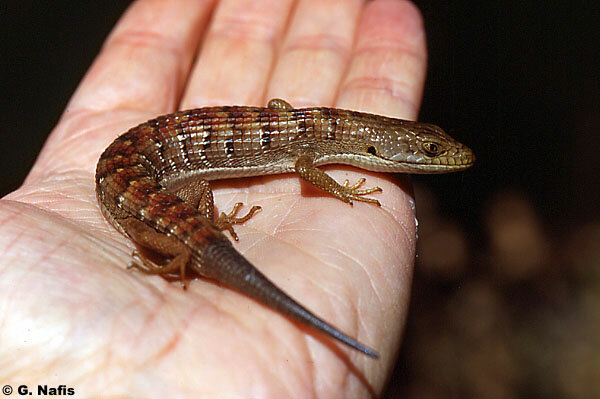 E. multicarinata ranges from 2 7/8 - 7 inches in snout to vent length (7.3 - 17.8 cm) (Stebbins, 2003) and up to aprox. 12 inches (304 mm) in total length. 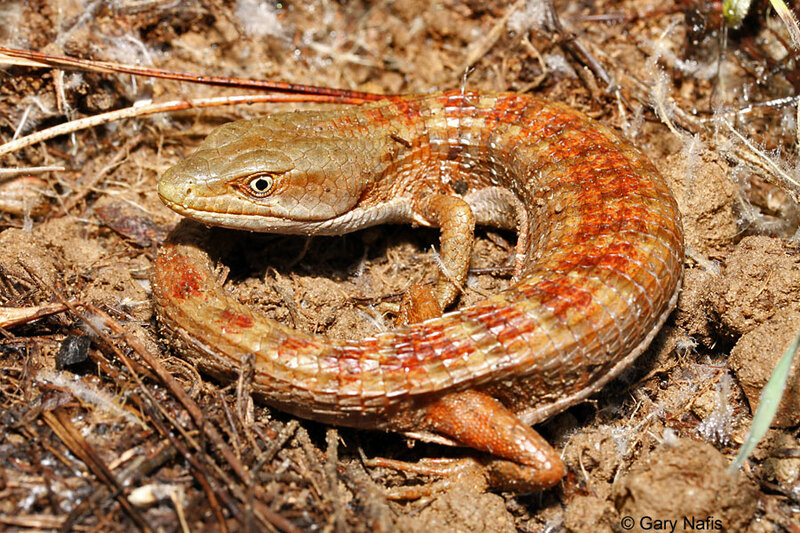 Alligator lizards, genus Elgaria, are members of the family Anguidae, a family of lizards found in the Americas, Europe, Asia, and Africa. 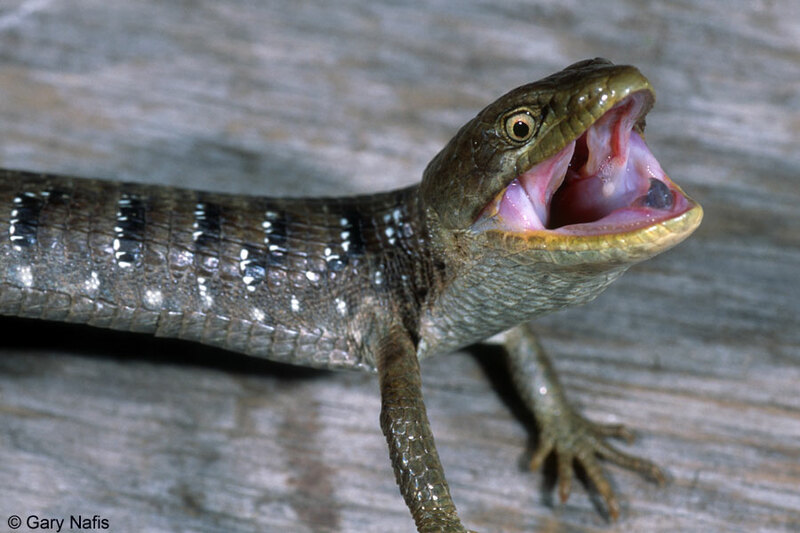 Large bony scales, a large head on an elongated body and powerful jaws probably give the lizards their common name. They are characterized by a thick rounded body with short limbs and long tail. 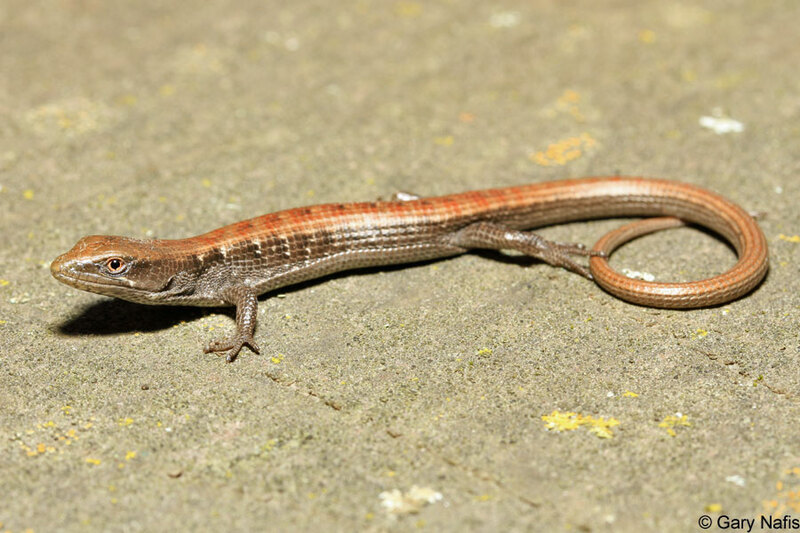 The tail can reach twice the length of its body if it has never been broken off and regenerated. 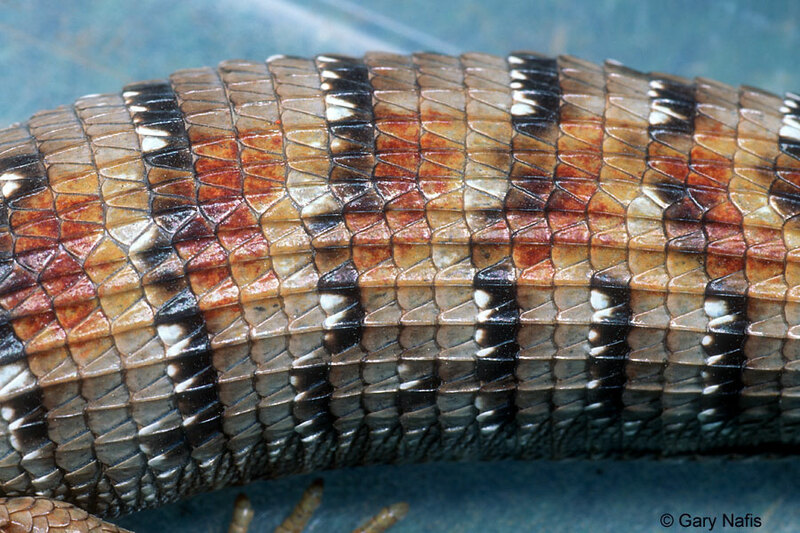 Scales are keeled on the back, sides, and legs, with 14 rows of scales across the back at the middle of the body. 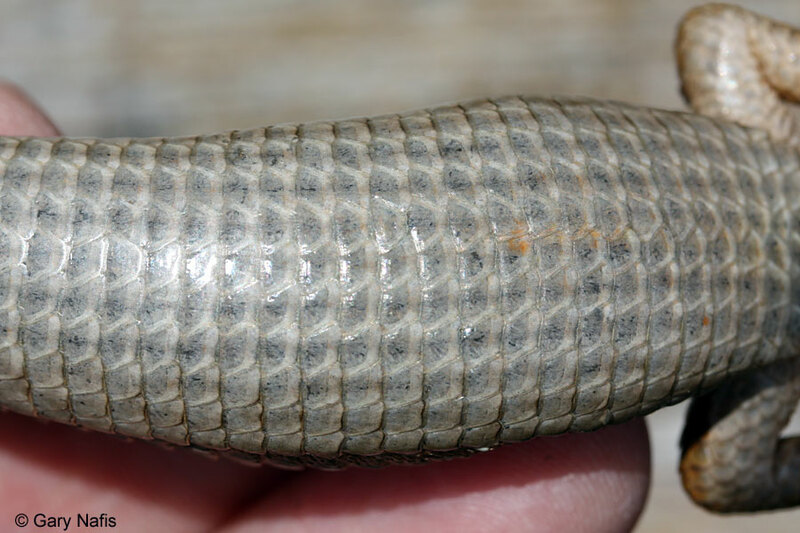 The scales of this subspecies are less heavily keeled than E. m. webbii. 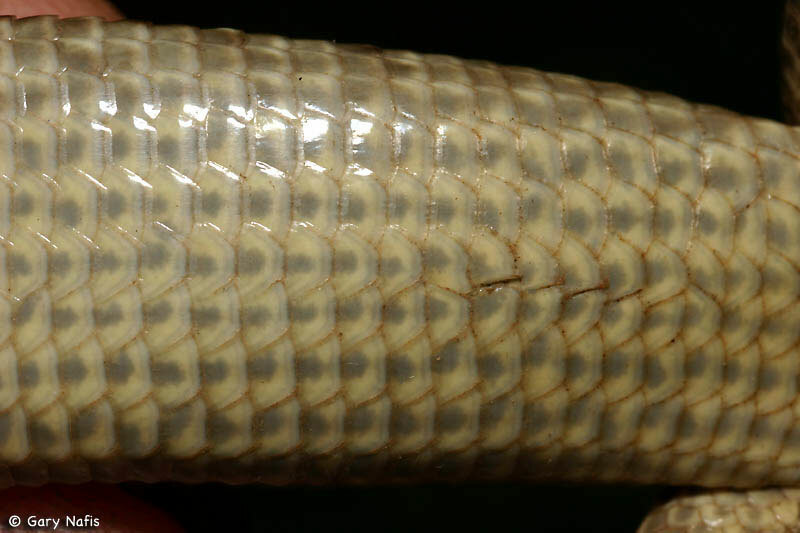 A band of small granular scales separates the larger bone-reinforced scales on the back and on the belly, creating a fold along each side. These folds allow the body to expand to hold food, eggs, or live young. The fold contracts when the extra capacity is not needed. The head of a male is broader than a female's with a more triangular shape. Color is brown, grey, or yellowish above, with red blotches on the middle of the back. Usually there are 9 - 13 dark bands on the back, sides, and tail, with adjacent white spots. 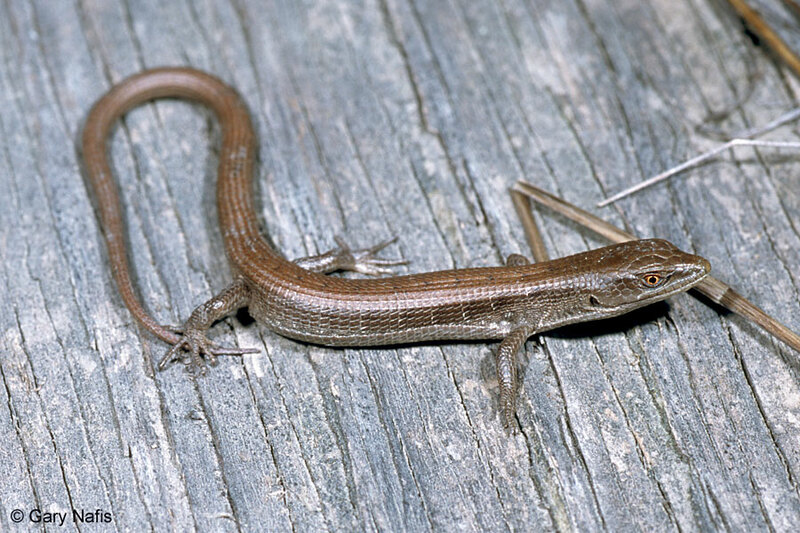 On some lizards these dark bands are very pronounced, on others they are covered with reddish or yellowish color. The eyes are light yellow. The head is usually mottled with dark color. Hatchlings are very thin and small, roughly 4 inches long, with smooth shiny skin with a plain tan, light brown, or copper colored back and tail. The sides are darker and sometimes mottled or barred as they are on adults. 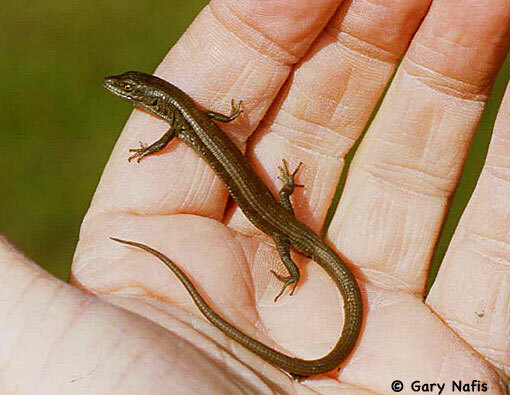 Juveniles gradually develop the large scales and heavy dark barring found on the back and tails of adults. Diurnal, crepuscular, and sometimes nocturnal: active during daylight and twilight, but sometimes active at night during hot weather. Inactive during cold weather in winter. 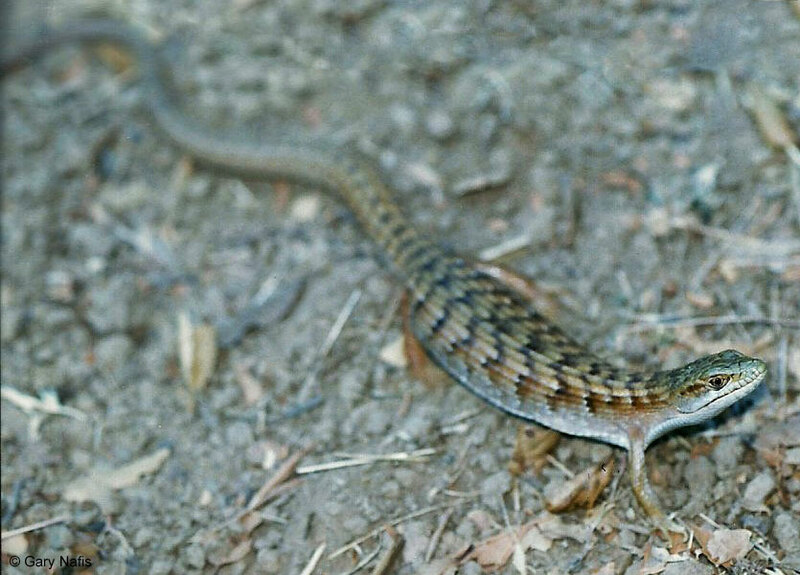 Moves with a snake-like undulating motion, often tucking the rear legs up against the side of the body and pulling itself along on its belly with the front feet. 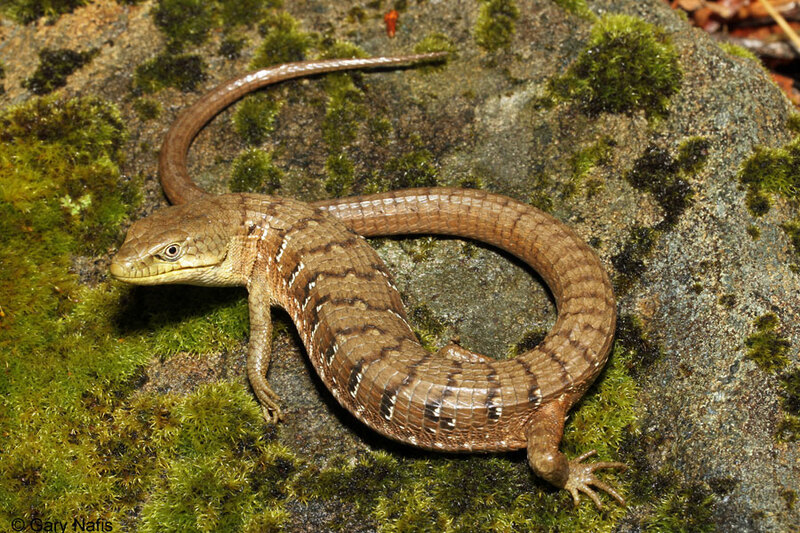 The slightly prehensile tail can be used to wrap around vegetation when climbing. A good swimmer, sometimes diving into the water to escape by swimming away. 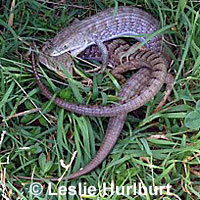 The tail of an alligator lizard is easily broken off, as it is with many lizards. The tail will grow back, although generally not as perfectly as the original. 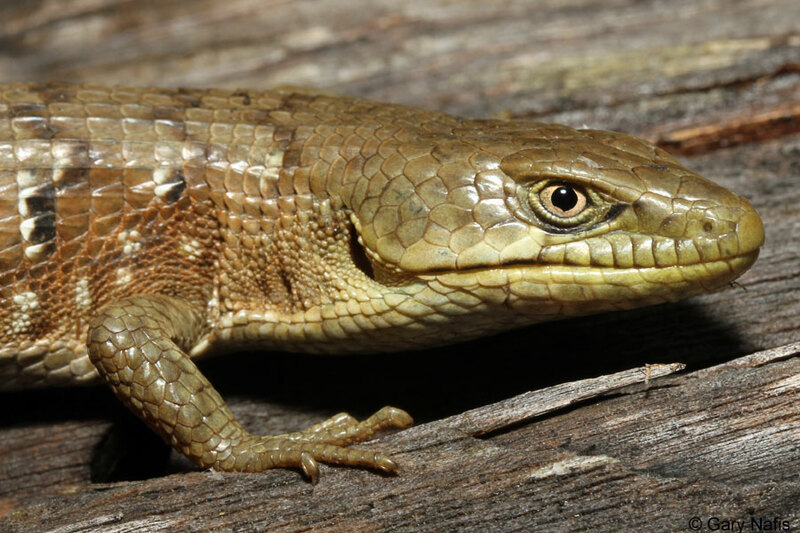 A lizard may detach its tail deliberately as a defensive tactic. When first detached, the tail will writhe around for several minutes, long enough to distract a hungry predator from the lizard. 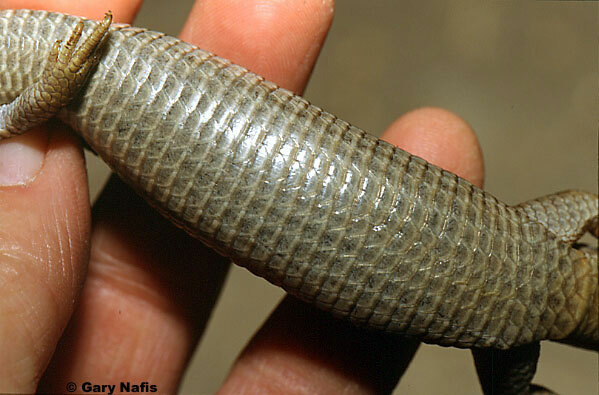 Males sometimes also extrude the hemipenes when threatened. 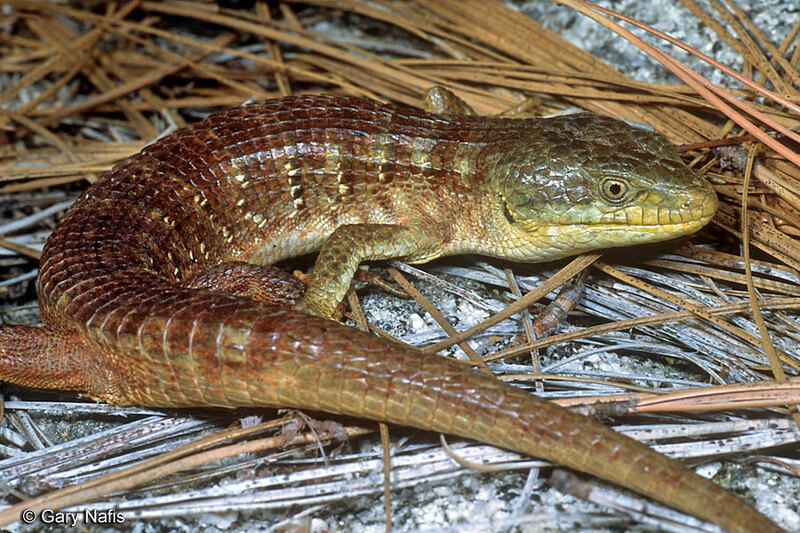 Often when an alligator lizard is observed lying still or basking, it will tuck its legs back toward the body. 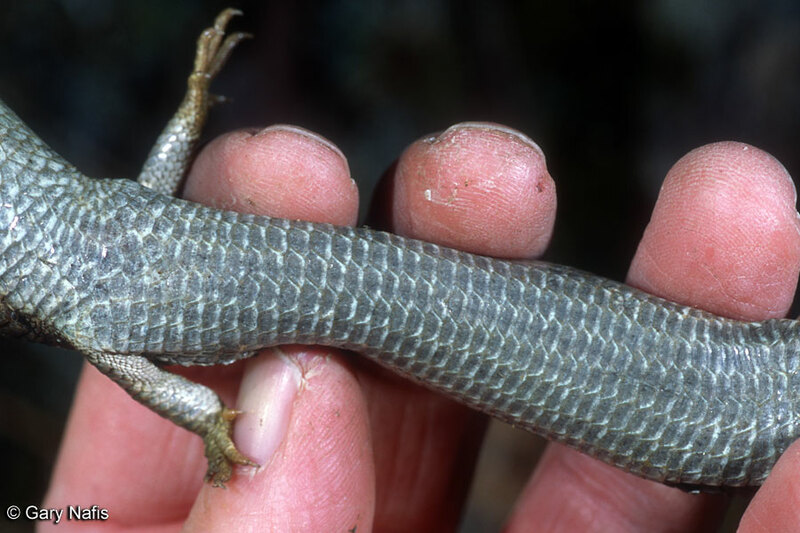 This is probably a defensive measure to break up the outline of the lizard's body so that a predator can't tell that it's an animal with legs. This might be to give it the appearance of a stick or shadow or something not alive, or it might be to imitate a snake, since many animals are naturally afraid of snakes and will hesitate to approach or attack a snake. 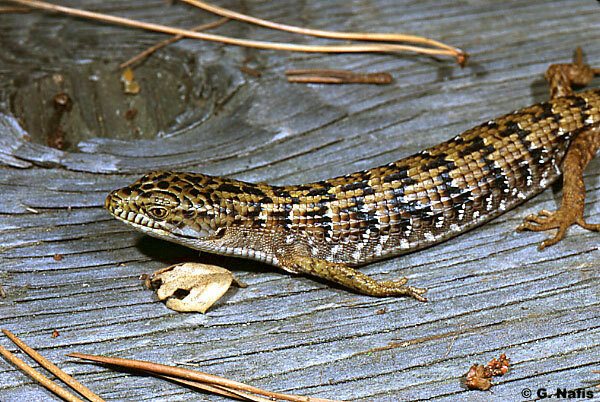 Other defensive tactics used by alligator lizards are smearing the contents of the cloaca on the enemy and biting. 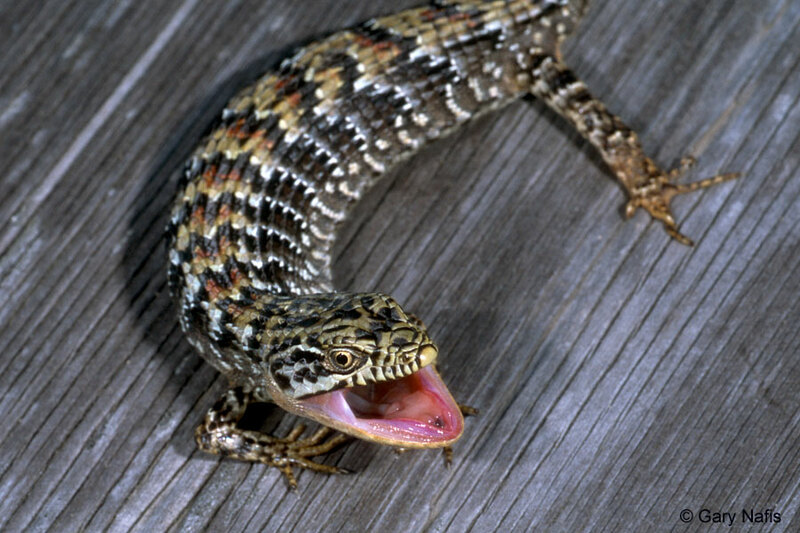 They often bite onto a predatory snake, on the neck or the head, rendering the snake unable to attack. 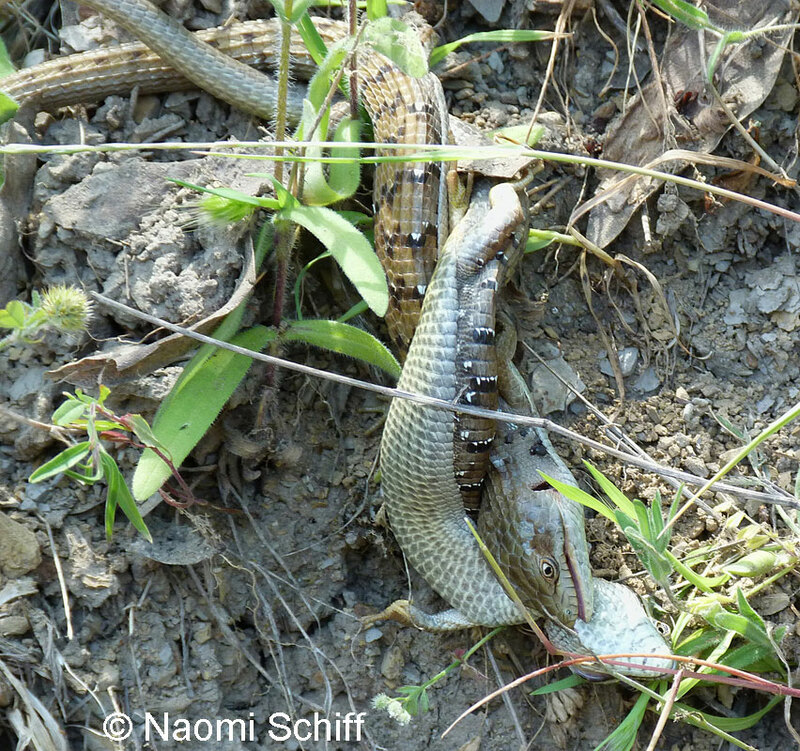 Samuel M. McGinnis (Stebbins & McGinnis, 2012) reports seeing a juvenile alligator lizard bite onto its own tail making itself impossible to be swallowed by a juvenile Alameda Striped Racer, which eventually gave up. 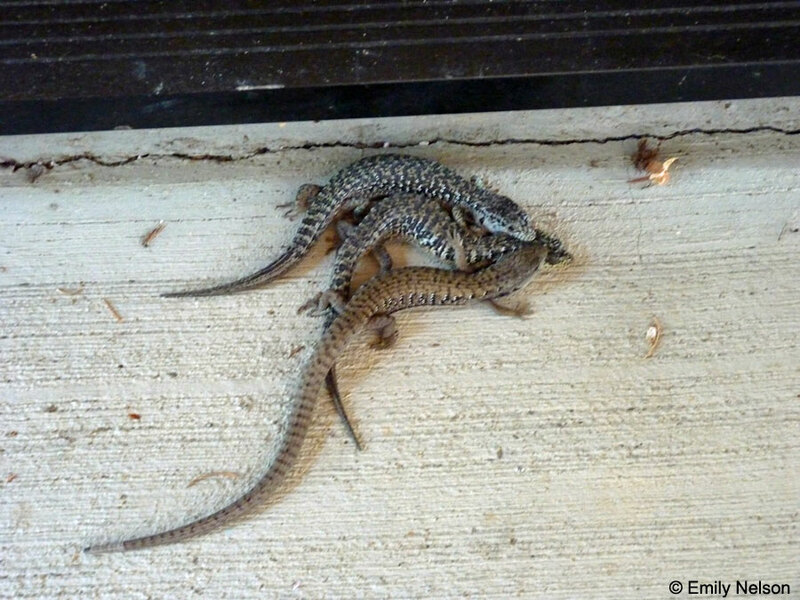 Mating occurs in Spring, most likely from April to May. Eggs are laid sometime from May to July and they hatch during late summer and early fall. 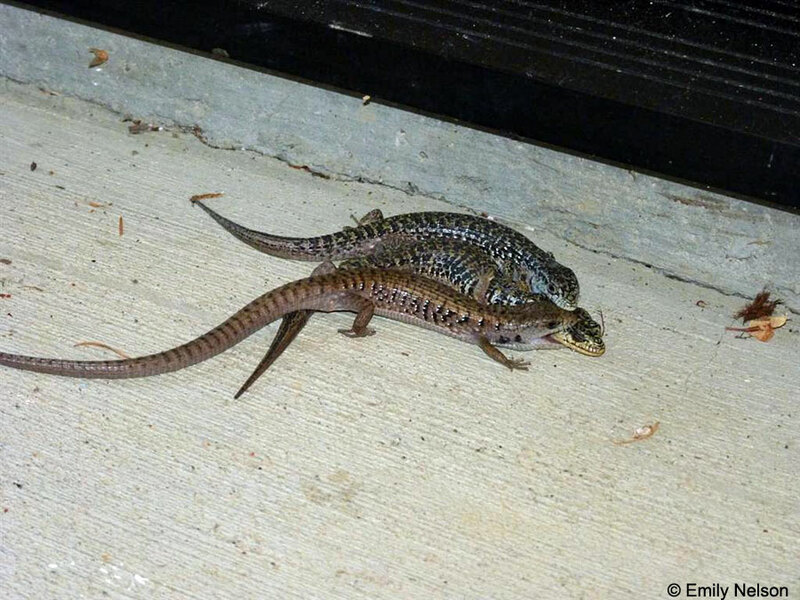 During the breeding season, a male lizard grabs on to the head of a female with his mouth until she is ready to let him mate with her. They can remain attached this way for many hours, almost oblivious to their surroundings. Besides keeping her from running off to mate with another male, this probably shows her how strong and suitable a mate he is. 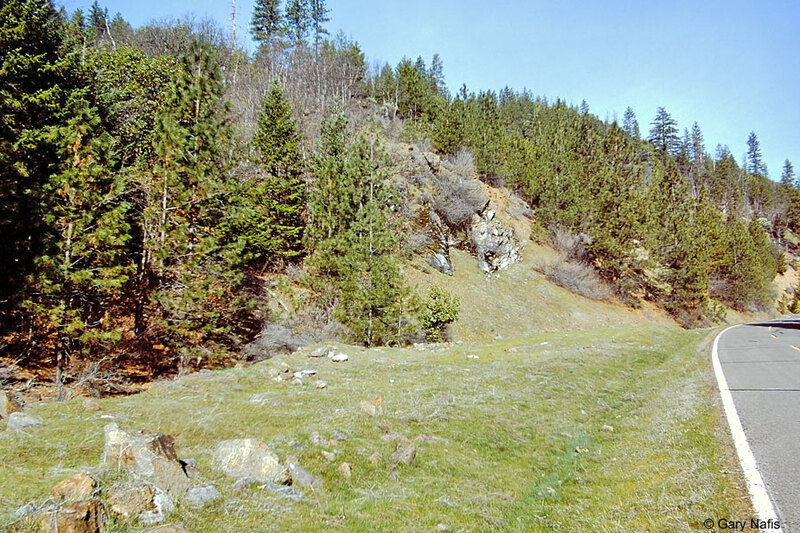 Grassland, open forest, chaparral. 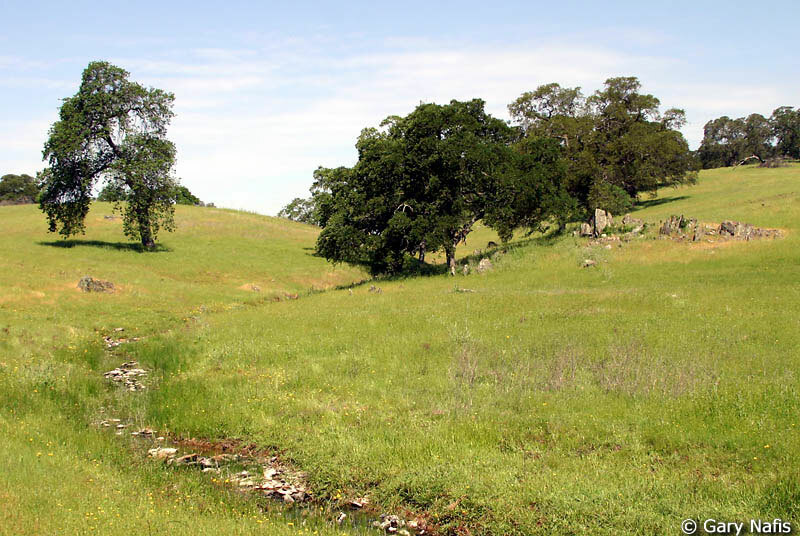 Common in foothill oak woodlands. Commonly found hiding under rocks, logs, boards, trash, other surface cover. 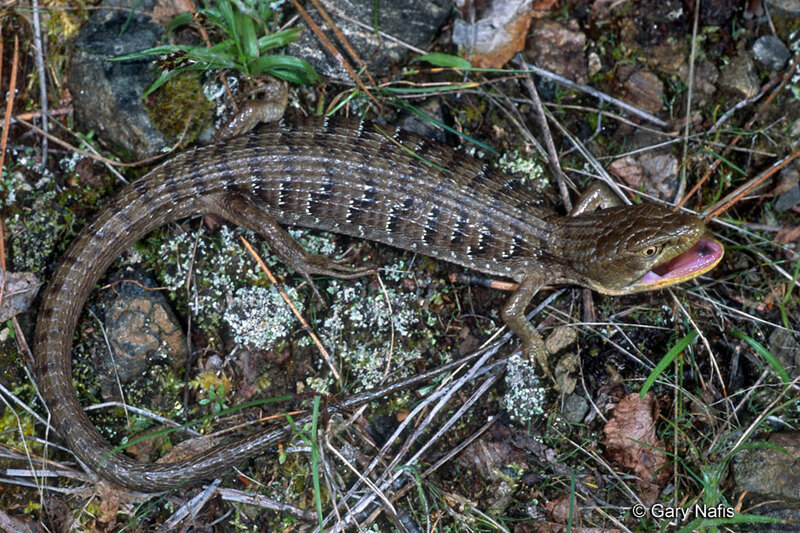 The subspecies Elgaria multicarinata multicarinata ranges from Washington State south along the coast to Monterey Bay and through the northern Central Valley east to the Sierras south to northern Kern County. 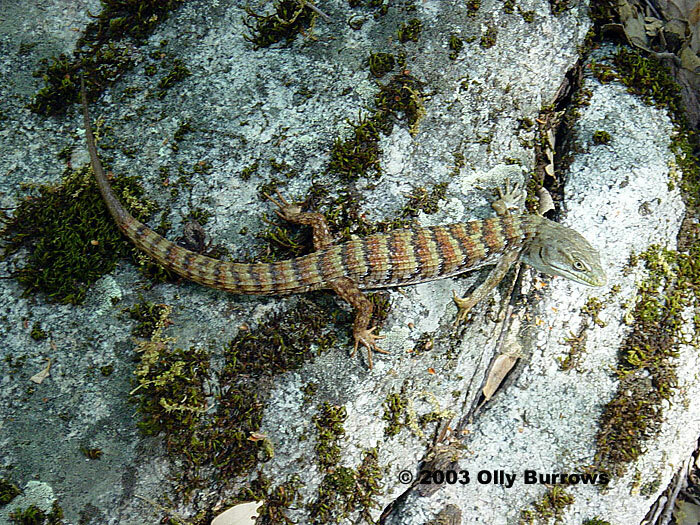 In his 2003 field guide, Stebbins states that the species Elgaria multicarinata occurs from sea level to 5,000 ft. in elevation (1,524 m.) but I've seen them at 6,200 ft. in the San Bernardino Mountains and they have also been found at 7,250 ft. (2,210 m.) on Frazier Mountain in Ventura County. "A molecular phylogeographic study of Feldman and Spicer (2006, Mol. Ecol. 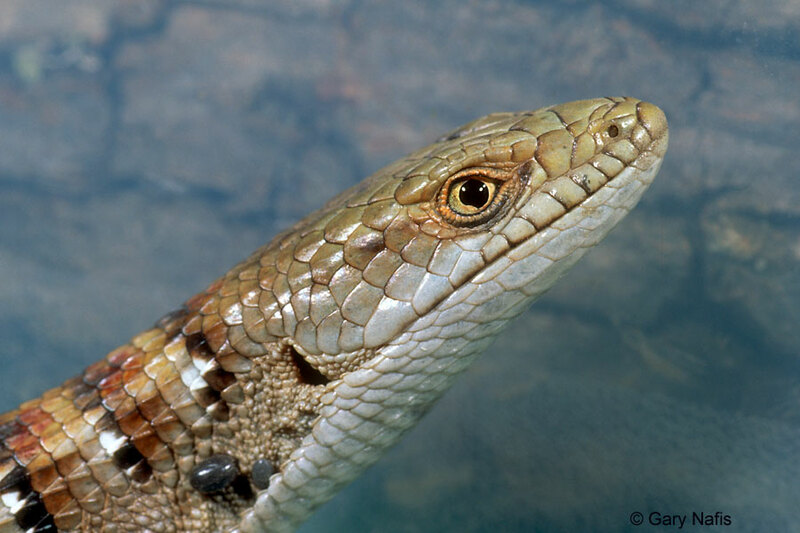 15: 2201–2222) failed to support currently recognized subspecies boundaries within E. multicarinata (Fitch, 1938, Am. Midl. Nat. 20: 381–424). 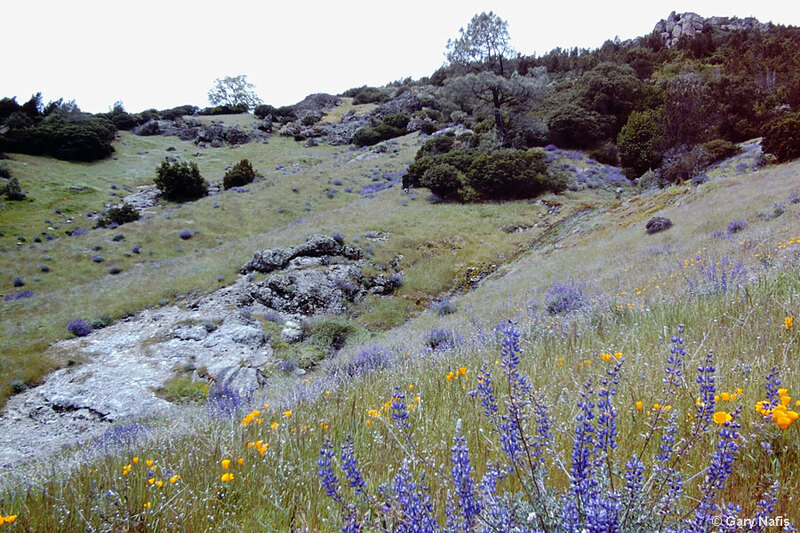 Haplotypes from the central Coast Ranges of California (formerly multicarinata) are more closely related to those from southern (webbii) rather than northern (multicarinata) California, while haplotypes from the Sierra Nevada (formerly webbii) are more closely related to those from northern (multicarinata) rather than southern (webbii) California. In addition, haplotypes representing E. m. multicariniata and E. m. scincicauda are phylogenetically intermixed, calling their separation into question." 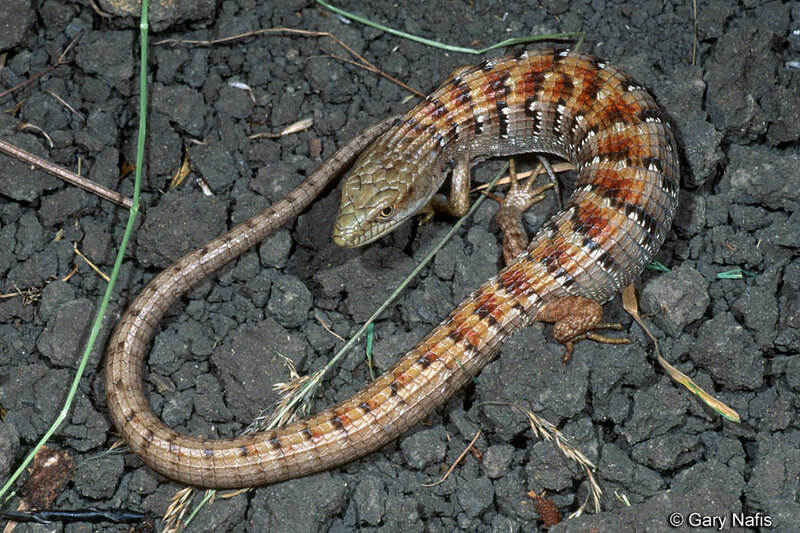 E. m. scincicauda - Oregon Alligator Lizard is no longer recognized. 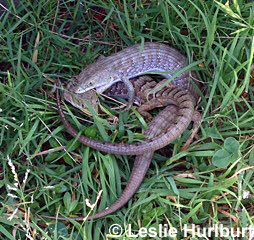 Lizards formerly recognized as that subspecies become E. m. multicarinata - Forest Alligator Lizard. 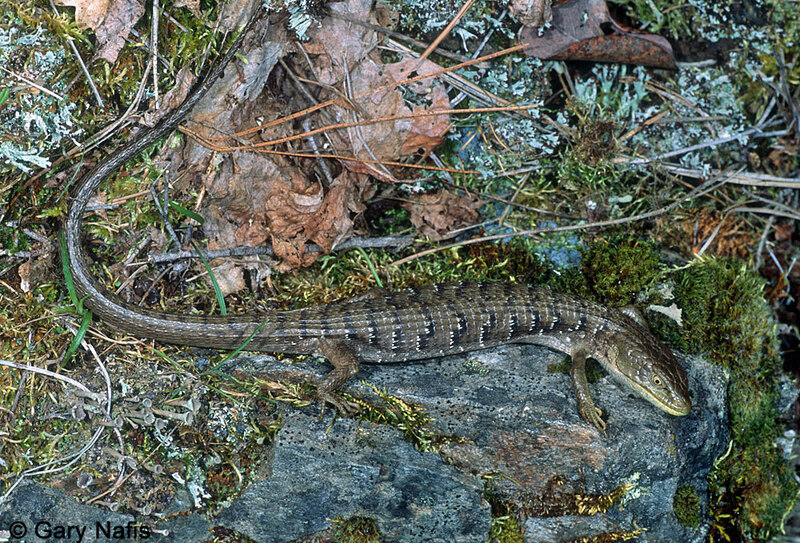 E. multicarinata in the Sierra Nevada mountains, formerly E. m. webbii, become E. m. multicarinata - Forest Alligator Lizard. 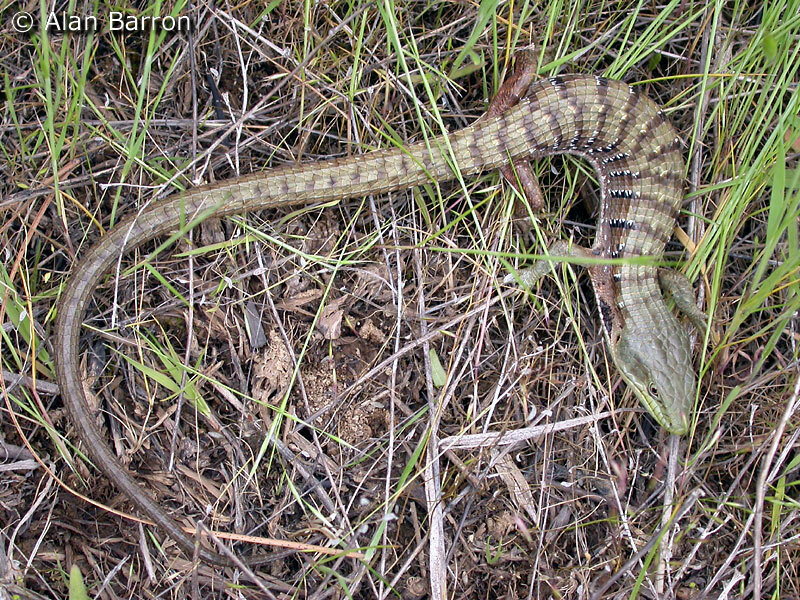 E. multicarinata in the central Coast Ranges, formerly E. m. multicarinata, become E. m. webbii - Woodland Alligator Lizard. 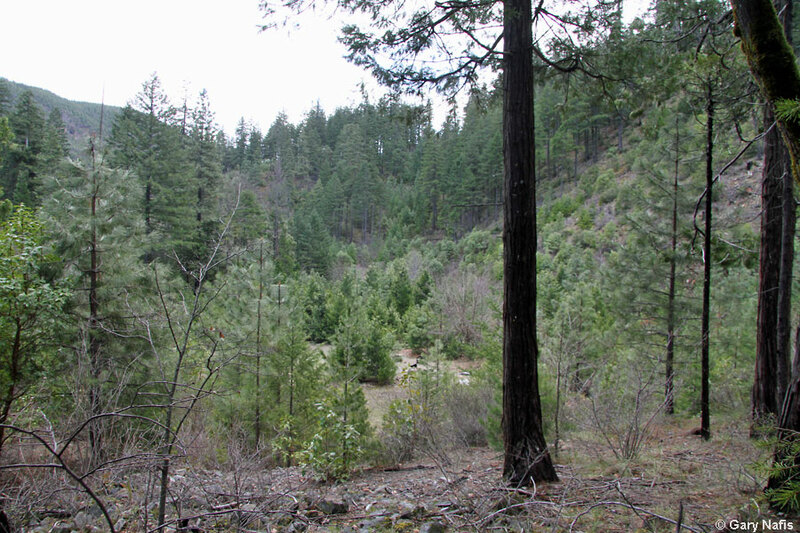 The contact zones between the subspecies are in the Monterey Bay area and in Kern County north of the Kern River. Formerly placed in the genus Gerrhonotus, with the Latin name Gerrhonotus multicarinatus multicarinatus. 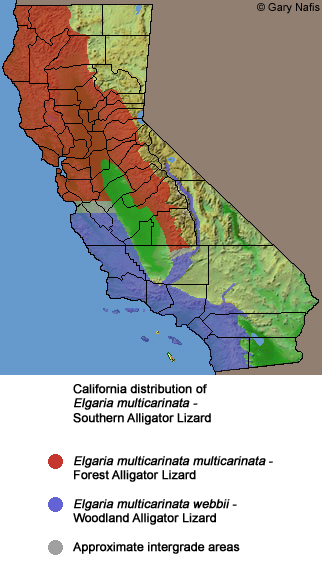 Elgaria - obscure - possibly named for an "Elgar" or a pun on "alligator." Chris R. Feldman and Greg S. Spicer. 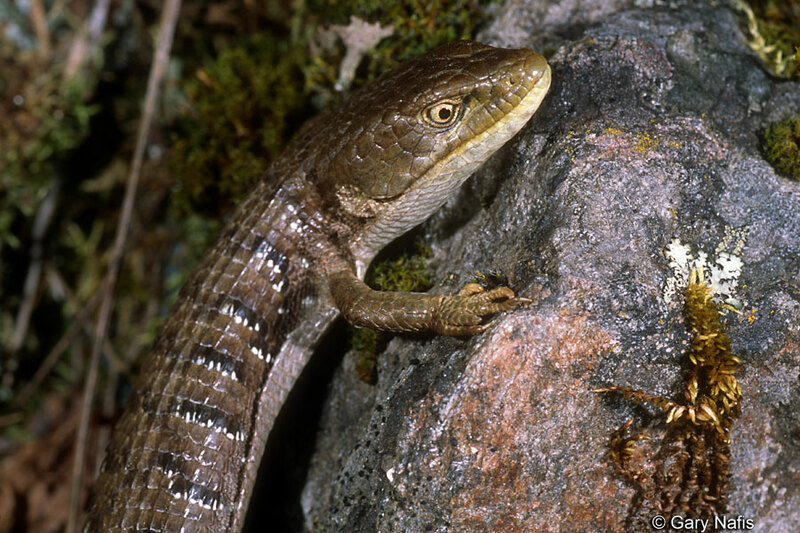 Comparative phylogeography of woodland reptiles in California: repeated patterns of cladogenesis and population expansion. Dean H. Leavitt, Angela B. Marion, Bradford D. Hollingsworth, Tod W. Reeder. 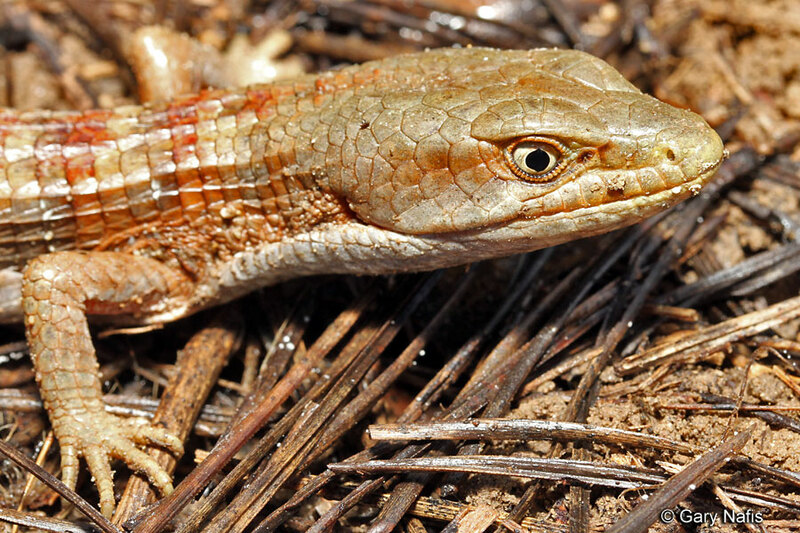 Multilocus phylogeny of alligator lizards (Elgaria, Anguidae): Testing mtDNA introgression as the source of discordant molecular phylogenetic hypotheses. Molecular Phylogenetics and Evolution 110 (February, 2017) pp.104–121.